Our Lady of Guadalupe left a miraculous Image of herself on St. Juan Diego’s tilma especially for the Latin American people on December 12, 1531. The Aztec Indians saw her Image filled with motherly love and mercy, totally the opposite of their earlier terrifying false gods, and believed her to be the Mother of the True God as well as their own Mother. They abandoned their idolatrous worship and stopped the horrible human sacrifices. Over just 7 years, 10 millions of them embraced the Catholic Faith and received Baptism. 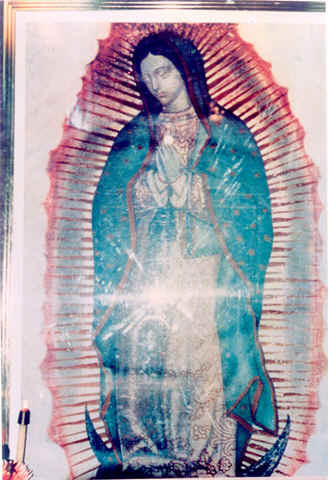 To accomplish her plans, Our Lady gave us the Special Photograph of the Missionary Image of Our Lady of Guadalupe on August 15, 1991 at the National Sanctuary of Our Sorrowful Mother in Portland, Oregon. This photograph is supernatural, because the addition or revealing of the new images to the original Image of 1531 was realized not by human brains and hands but by God Himself, and this photograph should become available to every person in the world. This photograph will increase our Faith in and Love for God and Our Lady and will protect us from dangers and evil temptations and encourage us in our good work. This photograph is the most precious gift for each of us, next to the Eucharist. Spread this photo-graph widely and enlighten people to understand God’s Will and Our Lady’s Wishes. Special note: Distribution of this photograph was approved by His Excellency Archbishop Alexander K. Sample of the Portland Archdiocese on 7-3-2014. Visit: www.marys-touch.com for more information.